Ideal towels for bathing, beach or swimming pool. 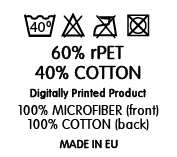 Composition: 70% cotton, 30% microfibre. It can be personalised on one side. Amazing towel that can be 100% personalised. It is really soft, great for you to lie on it or to dry yourself after a shower or after swimming at the beach or in the swimming pool. Your favourite artist? Your pet? A car? Videogames? Some pictures with your friends or relatives? You choose the design you want to use on it. The measures are approximate and, during the cutting and printing (which is made with heat) the they can vary down to 7 cm. in relation to the given ones.